As I approached the entrance to the park, the first thing I sensed was not the expected visual of a kite in the sky, but the sound of a wind chime that had to be the size of the smokestack on the Titanic. Then: I entered a broad expanse of lawn with several small groups of people, mostly families, happily tethered to tiny blue or purple specks in the sky. It was a little chilly out, but luck brought some wind for the event, so some of the kites were pulling their humans directly from the clouds. In some cases I couldn’t even see the kites. I’d never yet participated in an Earth Day event, likely because I feel that every day should be (or is) Earth Day. 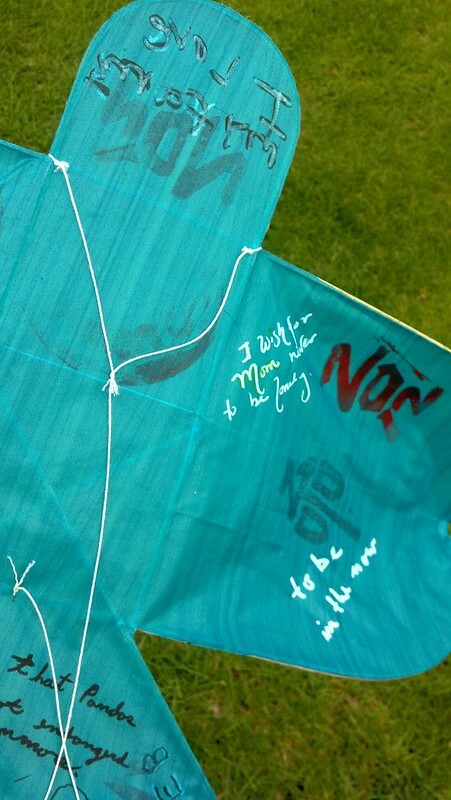 The invitation to this Wishes for the Sky event caught my attention mainly as it came from my talented friend, artist Marcus Young, but also as it involved kite flying in a park very close to my home. Next: Bright fabrics whipping in the wind gusts drew me toward a few structures that resembled some of the sukkah frames that my friend Jeremy has constructed. I’d found the source of the music: many wind chimes, exposed both to the wind and to a few microphones that amplified their sounds throughout the park. The open structure and low placement of the chimes were very inviting: I reached out to nudge a clapper or two, in a moment of relative wind calm, and thus started my participation in the event. What fun – so often in stores that sell chimes, there are similar, smaller structures but given the space and a likely weary shopkeeper, I’m always hesitant to activate even the tiniest chime. Liberated! I then found Marcus, who made sure that I was on my way to get a kite. He directed me into the pavilion: there were several steps involved in procuring a kite and the first of them was very important. It was also my very favorite part of the event – and almost of the whole weekend (I say “almost” as the weekend had also included a rare and very enjoyable visit from my mom). Calligraphy, poetry, and helpful volunteers filled the room. I was in heaven, and with guides. For as long as I can remember, I’ve loved calligraphy, and after surviving the required poetry memorization in grade three, poetry’s been something I love as well, for a very long time. 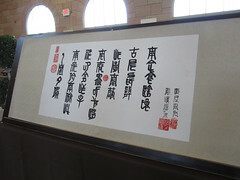 To top it off: the artist who made the scrolls, Shen Pei, was there to explain the art and to help me read them. It’s funny, I first saw the lovely, expressive characters and they seemed more unfamiliar than usual. I am unable to read any characters other than the roman characters you see here on this page, but am somewhat familiar with the types of strokes and assemblies of a Japanese, Chinese and Korean calligraphy. This calligraphy was weird. Well, it was in English. Elegant, stacked, serpentine and collaborative strokes spelled out each word of a wish or of a poem, as your gaze moved down and over the page. Had the volunteer and the artist not encouraged me to really look into the characters, I would have missed this aspect of the installation. 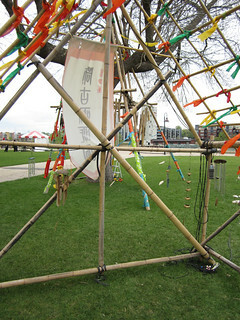 It was otherwise beautiful (the little chicks on one scroll were adorable; the koi fish on another were in elegant juxtaposition to the urban waterfront event), but to be able to thus engage with the art was a treat. I arrived cashless but later visited the site to donate, as I really want this event and others like it to flourish. On, to my kite. Still in the pavilion, I sat with another volunteer, who explained the significance and the process of preparing and flying one of these little rice paper-and-bamboo numbers. I chose one that in prior years, a wisher had drawn a panda and a bunny, which related to the wishes also written on the kite. I took it over to the writing table and added my wish, then found the string-dispensing volunteer. Shortly thereafter, my wishes, and those from prior years, were sent up and away. As the sky tugged on my string, I was thankful, as cold as my fingers had become. Few things are as disappointing as having a kite on a day with no wind. Earth Day 2012 brought me back to a day I flew a beautiful red kite with Saturn on it, on a beach in Oregon, so many years ago. The rhythm of drums drew me and my kite back to a volunteer table: the event was to close with a drumming ceremony and I’d gotten there just in time. As the sound (my instrument was my two hands, clapping) and excitement intensified, a larger red kite lifted up, signifying the end of the event. I started my walk home, feeling so very glad that I fit this activity into my day, weekend, and year!